Jurors have seen dozens of photographs in the first two days of James Alex Fields' murder trial in Charlottesville for the 2017 death of Heather Heyer. See photos. 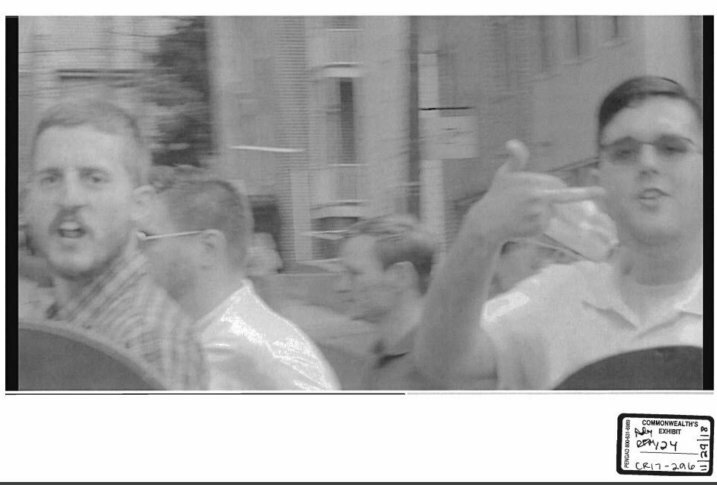 WASHINGTON — In the first two days of the trial of James Alex Fields for the murder of Heather Heyer during the August 2017 white nationalist rally in Charlottesville, Virginia, jurors have heard differing stories about what happened — they have also seen photographic evidence. The jury has gotten its first look at evidence presented by the prosecution, aimed at convincing the 12 jurors and four alternates that Fields drove his Dodge Challenger into a crowd of counter-protesters on 4th Street with premeditation, which is a required element for a first-degree murder conviction. After the first two days of testimony, prosecution evidence was made available to the public. The defense will have the opportunity to present evidence after the prosecution makes its case. The fatal Aug. 12, 2017 crash that killed 32-year-old Heyer came after a series of violent clashes broke out on the streets of Charlottesville between white nationalists and counter-protesters. A report commissioned by the city later criticized the police response as ineffective. The intersection where the fatal crash occurred had been blocked off with only a plastic sawhorse.